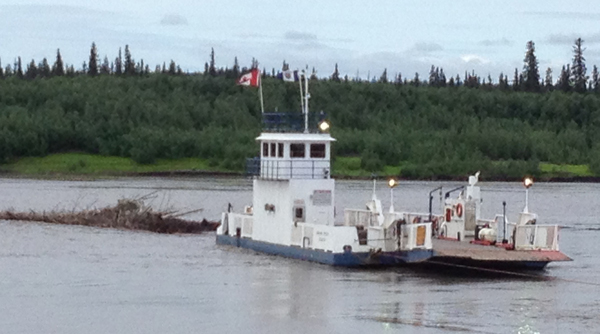 We spent the day watching the ferry men ram the log-jam with the ferry. We think, but are not entirely sure, that the road may be repaired by tomorrow. 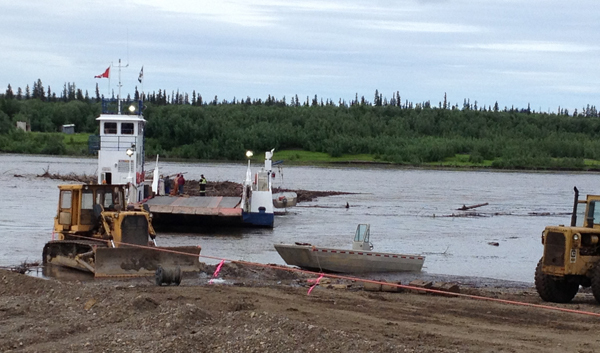 Day spent watching ramming of log-jam into the ferry to break up little pieces. You can only watch debris float down river for so long. It is the hot ticket in town though. Dave the trucker called Eagle Plains and learned that the culvert was salvageable. They had the culvert in place and stabilized with wood by 1 p.m. yesterday. 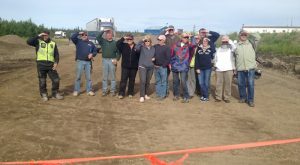 They were waiting for dump trucks of gravel and fill to be hauled in to cover the culvert, and then they could resurface the road. The road may be ready to cross as early as tomorrow afternoon. We were so thankful to Dave for keeping us in the CB-loop that we gave him our last cold beer. Dave almost cried. The man has been sitting in his truck starring out his windshield for five days. He does not want to leave his truck because he has 1,000 liters of fuel in tanks on the bed. He is worried about his gas. He thinks the road will be open soon. If we could only get across the effing Peel River! Locals are using small boats to go across. No way we can put motorcycles in those. 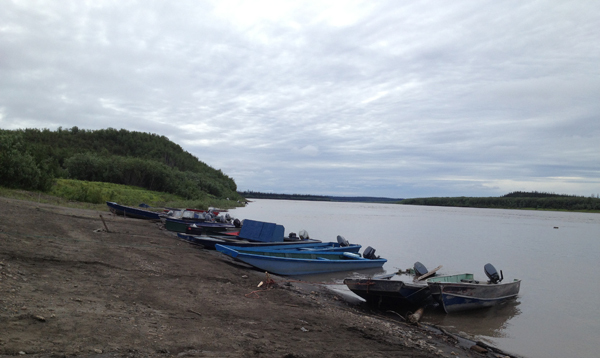 The tourists are gathering on the north side of the Peel River with mutiny in the air. There is talk about boarding the boat. 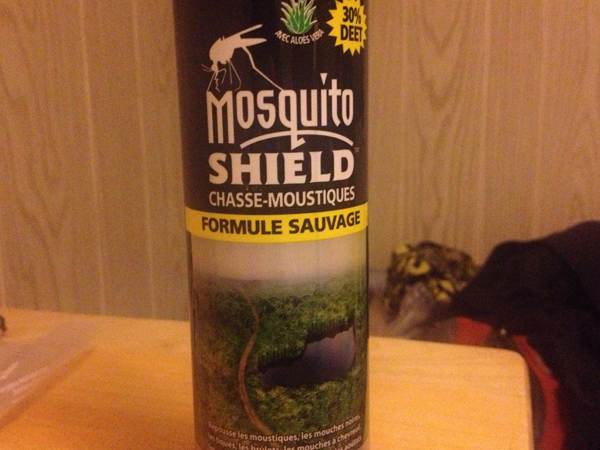 Of course it is all fantasy, but that is what intoxication from days of DEET does to you. 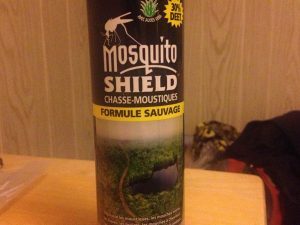 30% DEET is guaranteed to make tourists fantasize about mutiny. Note the image of the trail in the wetlands. The Canadians from other provinces are convinced there is a plot against the Natives, the Europeans are incredulous, and the Alaskans are just tired. All of us have ideas on how the job could have been done more efficiently. I got all the tourists to line up in protest. They are all watching the agonizingly slow work on the log-jam. 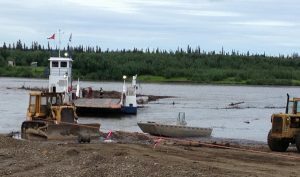 The contractors for the ferry company are pointing fingers at the NWT transportation government office. 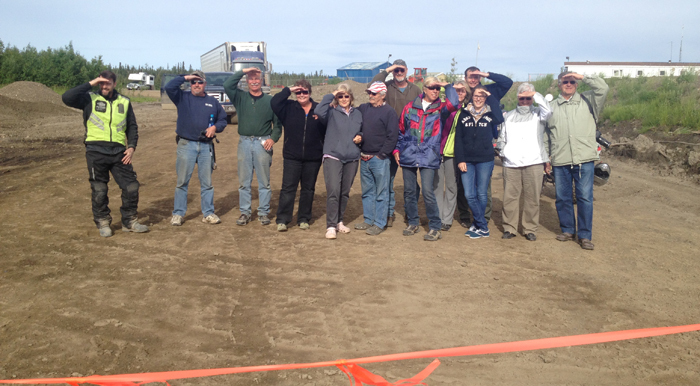 The NWT transportation government office is pointing fingers at the contractors. It appears they argued for two days trying to figure out who was doing what and, more importantly, whose fault it was. Finally, today they tried to work together to get something done. A full day of ferry-ramming seems to have finally cleared up the log-jam. Tomorrow they must check the line for damage and re-anchor it. If the line is good, we may be able to cross tomorrow. None of us are holding our breath. Finally, after two days of watching debris hang on the lines, workers move to stop more debris from getting hung up. 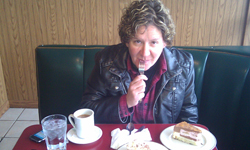 The B&B owners brought us over a frozen-solid turkey (like you have for Thanksgiving). They were concerned we didn’t have enough to eat. We thanked them and put it in the freezer. I turned to Michael and said, “It will take a full day for that bird to thaw out, and we can’t cook it until the day after. Do the townspeople know something we don’t about how long it will take to get out of here?” He shrugged his shoulders. The plan is to be down at the boat at 9 a.m. hoping like hell it is running. If we can cross the river, then we can camp at the washout until it is open.